Since the earliest times, countless witnesses have attested to experiencing apparitions or other ghostly phenomena and thousands of buildings and places have gained a reputation for being haunted. To ignore or dismiss these accounts would be foolish, to acknowledge them as proof without question or study would be equally so. Ghost hunting has never been more popular. Currently, in the UK, there are over nine hundred teams and in excess of twelve thousand individual ghost investigators. Many different methods are employed in the search for ghosts. Some investigators use techniques which are derived exclusively from the séance room and the use of mediums. Others draw heavily upon scientific thinking or make extensive use of equipment. Most investigators prefer methods that blend together the séance room and the scientist’s laboratory, often developing unique experiments of their own. But within this diversity lurk many pitfalls, and mistakes are common. How then should we investigate? How can investigators obtain the best information and evidence to support their investigations and draw meaningful conclusions from their data? The Society for Psychical Research has responded by commissioning a new and fully re-written version of its Guidance Notes for Investigators of Spontaneous Cases, Apparitions, Hauntings, Poltergeists and Similar Phenomena. First published in 1955 and periodically revised, this is the definitive handbook and resource for all those who are interested in studying, researching and investigating cases of haunted houses, ghosts, apparitions and poltergeists. 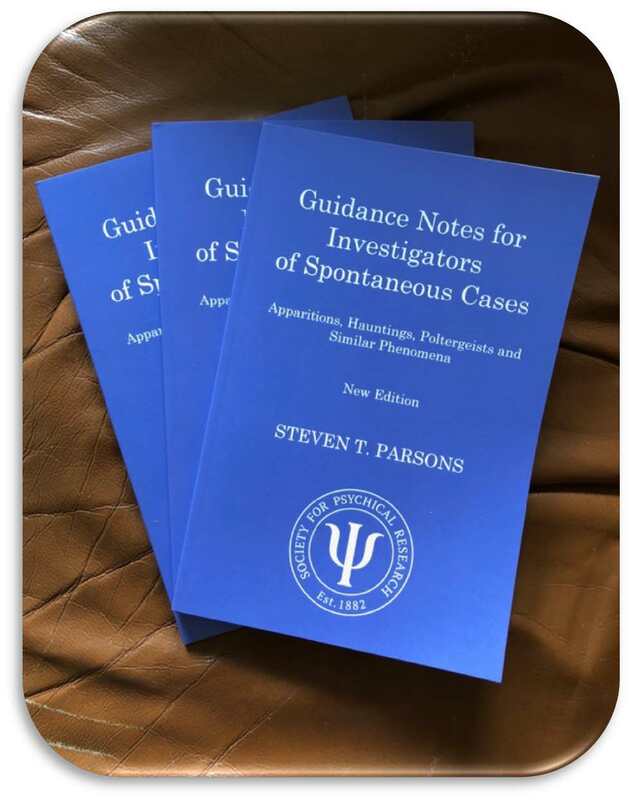 The New Edition of the Guidance Notes for Investigators of Spontaneous Cases, Apparitions, Hauntings, Poltergeists and Similar Phenomena draws upon the Society’s extensive experience and long history of investigating and studying such cases since its founding in 1882. Completely revised to take account of the latest techniques, research and theories associated with spontaneous cases and phenomena, this publication remains the go-to guide for everyone interested in this fascinating line of research and study. Copies of the book will be available at a discounted price of £7.50 for attendees on the day. Signed copies will also be available. In addition to launching the new Guidance Notes, the day will also feature a unique workshop and collaboration between the world’s oldest and most respected ghost study and investigating organisations: Society for Psychical Research (est. 1882) and The Ghost Club (est. 1862). Leading investigators from both organisations will discuss key subjects of interest relevant to the current ghost investigating community, presenting the latest research, trends and ideas in ghost investigation methods and techniques. This very special workshop is a fantastic opportunity for participants to discover more about the best and latest methods in ghost investigation and to learn more about the SPR and The Ghost Club and the many benefits of applying for membership of these organisations. The SPR library will also be open throughout the day. Places are limited; advance booking is strongly advised. Advance booking £20 for members of the SPR and The Ghost Club / £25 non-members. On the door (subject to availability) £25 / £30 – be aware that this may sell out! Tickets available from the SPR website at www.spr.ac.uk or telephone 020 7937 8984. Morning & afternoon tea/coffee included. There will be a 90-minute break for lunch (not included).